Back in the day, the number of toys licensed from comics books was paltry (certainly by comparison today) and what was available was often made cheaply. Much of which had to do with the materials that were available -- you couldn't afford to make heavily articulated, plastic action figures. So what happened on occasion was that toys were made out of paper or light cardboard; those were materials that were pretty accessible, fairly cheap, and easy to transport. So you got things like the set of Marvel Family fliers pictured here. A little Tab A/Slot B action, and you've got yourself a Captain Marvel figure that fly around. The thing I don't get -- and I've been trying to figure this out for nearly twenty years -- is why creators and/or publishers don't offer things like this as downloads today? Use them as promos for your new comic? A downloadable PDF that can be easily passed around and shared that people can then print out and put together some figures or a small playset or something. I know Chris Schweizer does some things along these lines for his Patreon backers, and Brian Fies did one at the conclusion of The Last Mechanical Monster, but I don't recall seeing someone try something like this as a promotional tool. There seem to be plenty of fans who put together custom-designed cubees of comic book characters, so it seems to me there's no real objection to the notion of papercraft or anything. And while I get that there's some time and effort involved, a company like Marvel or DC literally has this material from years ago literally sitting in their archives. Back in the '70s, Marvel did a full playset featuring the Baxter Building, the Daily Bugle, the Sanctum Sanctorum, and Peter Parker's apartment. 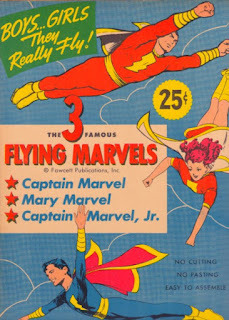 There's the Captain Marvel fliers noted above, and I'm pretty sure both Marvel and DC later had similar versions for other characters. Maybe it's just me. I think it's a clever, fun way to promote a comic and wouldn't cost anything more than a little time to design. Hell, I designed my own HERBIE the robot back when I ran my old Fantastic Four fan site. (I'll have to re-post that here at some point!) My point is that it's not that difficult. Just take a few cues from a half century ago, and put together some new promotional material that no one is else putting out there!